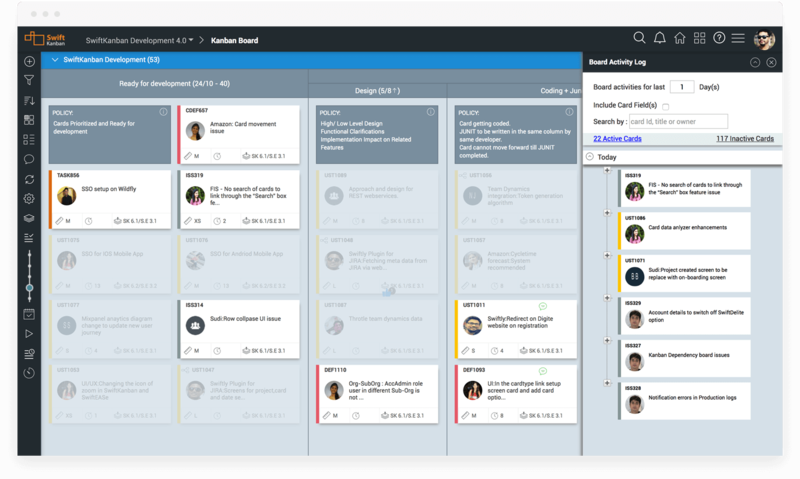 SwiftKanban provides an extensive set of features which help teams and individuals visualize work and flow, define policies such as WIP limits, highlighting bottle-necks, providing actionable analytics and key data for productive stand-ups, retrospectives, and other regular meetings. 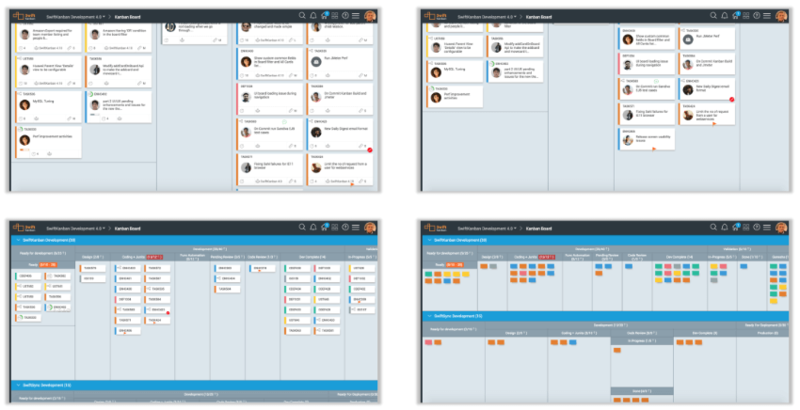 This works well even for a team of one – as a Personal Kanban. Define Work Cards of various types e.g. 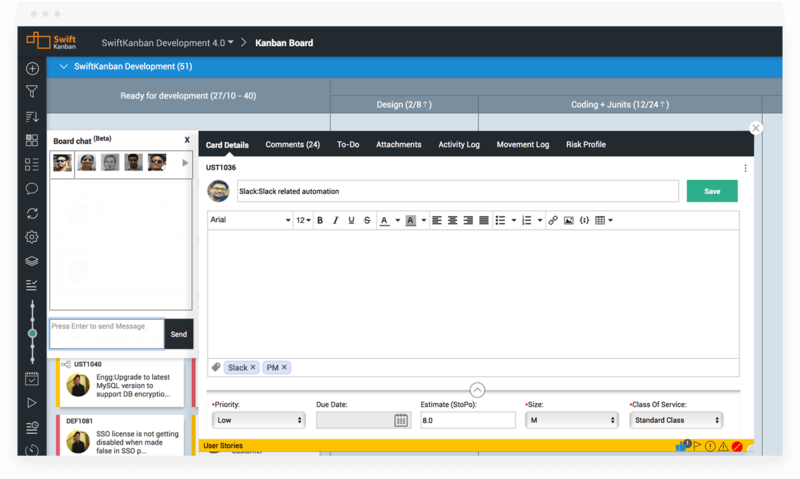 User Stories, Defects and Issues using a rich text editor, configurable template to define your backlog, which can feed work into the Kanban board. You can also set default TODO list for cards which can act as DOD (Definition of Done) or a generic checklist. 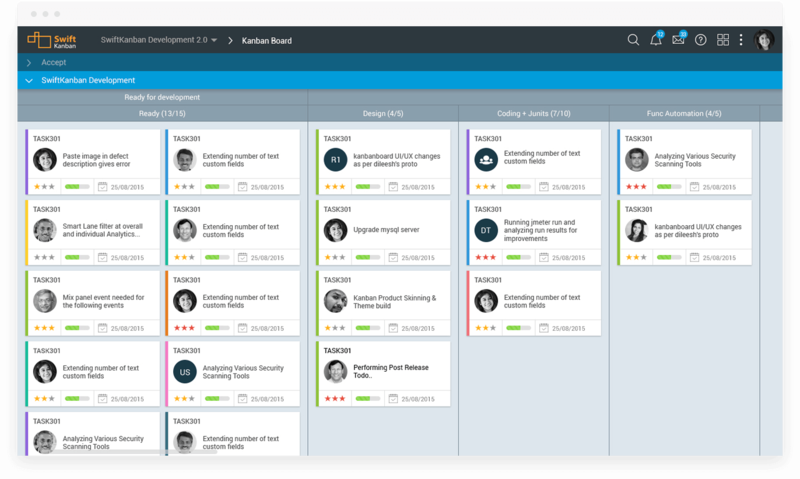 SmartLanes add tremendous flexibility and visualization to the Kanban board. SmartLanes can be associated with various card attributes such as Class Of Service, or Team Members, or even your own ad-hoc labels. As you move cards from one SmartLane to another, the associated attribute value is also reset accordingly and vice-versa! Archive Card – Archive cards from any lane to mark it done or if the user story has become obsolete. 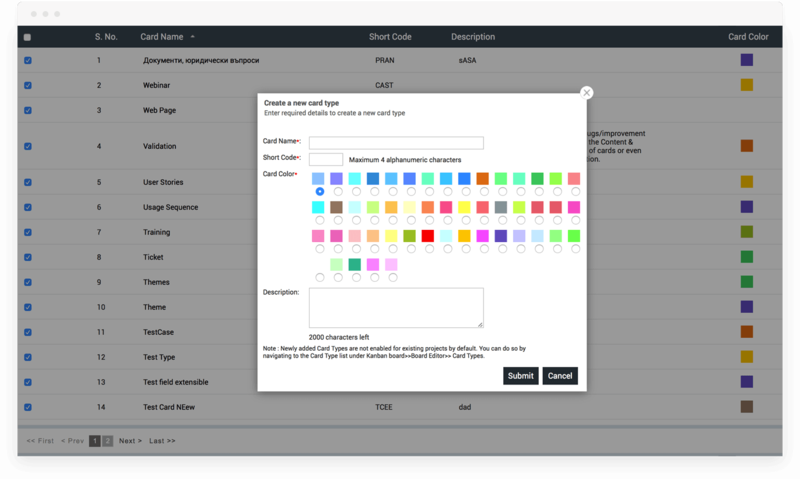 Clone Card – You can create an exact replica of an existing card to start a new user story with current settings of the card. 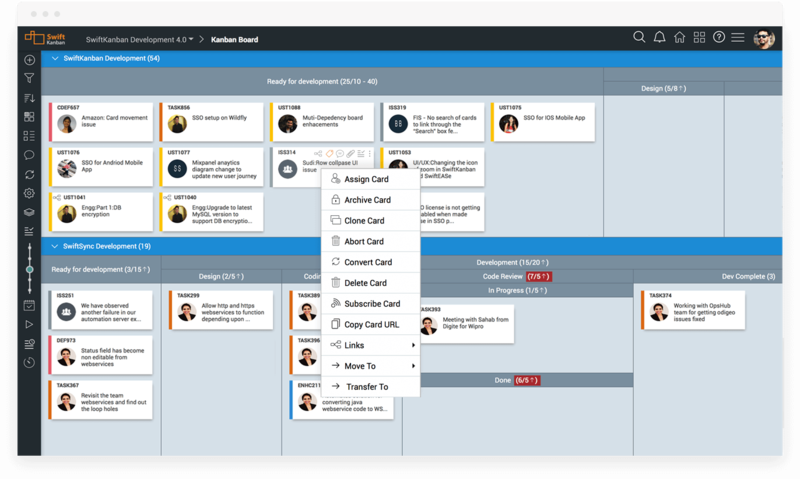 Move Card – Skip lanes and move the user story card to Backlog or any other lane on the board. The CFD is one of the most important metrics you need to look at when implementing the Kanban method. It helps you track the actual completion of work from Backlog to Archival or any stages in-between. It can also help forecasting the required throughput to complete backlog items based on the current progress. Our CFD is fully customizable to your needs. You can even choose your own colours for the different columns and the chart and your data can always be exported. 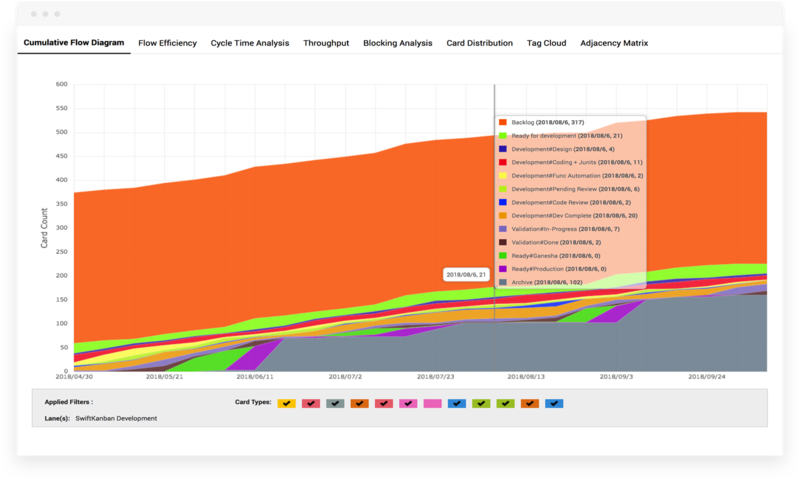 You can leverage the four detailed reports under “Cycle Time Analysis” to generate detailed information of the archived cards such as number of cards completed, average work time/wait time/block time and many more. You can filter the data based on your desired date range, view data on a weekly basis, expand data for any particular queue, and also export the generated data as a CSV file. Get different level of details using board zoom! 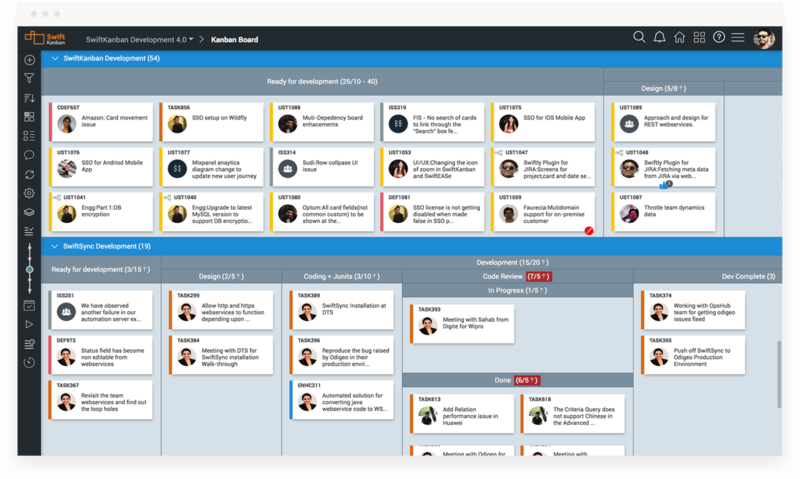 SwiftKanban encourages communication amongst the team and provides the capability for threaded discussions, instant chat with card owners and group discussion with members of the entire board. Mentioning your team-mates in comments is easy, just use @ and he/ she will get a notification in the widget and/ or by e-mail. See where the action is – or isn’t! Click the Aging icon on the left dock and you can see which cards have and have not been updated recently. The older the card updates, the more faded it will appear! You can also configure the number of days you want a card to be highlighted before the card’s due date.